Malnutrition is an abomination that is always presumed to only affect the third world countries. Yes, it is true, in third world countries we see it in the most abundant but that is because of the scarce resources they have. But what about the first world countries where everything is readily available and in the reach of the people? Why is it that 7 percent of the non-maternal and non-neonatal hospitals in the United States' (one of the richest countries in the world) is for patients facing malnourishment? It is describedas having an inadequate amount of calories or nutrients. You might consume three thousand calories a day and weigh 200 lbs., yet you can still be deemed malnourished. So how can nurses help when it comes to this? Typically, there are two kinds of malnutrition: Undernutrition and Overnutrition. The former type of malnutrition is the result of not getting enough protein, calories or micronutrients. It can cause a low weight-for-height ratio, stunted growth and being underweight. The latter is caused by the over-consumptionof certain nutrients like fat and protein causing a person to be substantially overweight or obese. To combat malnutrition, you need a balanced diet. Malnutrition is known to be the single largest disease contributor in the world. It weakens the immune system making it harder for people to fight off infections. The most common types of malnutrition are caused by a lack of protein, energy, along with iron, zinc, iodine and Vitamin A deficiencies. But there is also good news: Malnutrition is entirely preventable if the right care is given to it. Patients with malnutrition stay in the hospital three times longer than patients with other illnesses. Malnourished Patients who have had surgeries are at an increased risk to develop pressure ulcers, about four times more likely than a normal patient. Nurses are the healthcare professionals who usually conduct Nutrition Screening for the admission assessment. Nutrition Screening is identifying patients with nutrition problems or who are at risk of developing them. It is the first most essential step in determining malnourishment. There are several ways to determine this one of them being through weight. Comparing the current weight with the present weight or calculating the body mass index. BMI takes your height and weight into account and tells you where you stand. If you have a BMI of below 18 you are most likely malnourished. One other way of conducting nutrition screening are biochemical tests which are conducted in carried in clinical practices and can be affected by acute illnesses. Screening should be done regularly to ensure the patient is on the right track to good health. The measurements calculated by screening are then used to carry out an assessment. The following questions are taken into consideration. Has the patient been eating a balanced diet over the last few weeks? Has there been weight loss, intentional or unintentional? Rapid weight loss is a concern in all patients, regardless of their mass. Can the patient eat, swallow, digest and absorb enough food safely to meet their likely needs? Is the patient in need of an unusually high need for all or some nutrients? Is there any treatment, physical limitation or diseases limiting the patient’s ability to handle the nutrients needed to meet requirements? Has the patient suffered from excessive nutrient losses by for example vomiting or diarrhea, etc.? Is he undernourished by global assessment? Can the patient meet all of their requirements by voluntary choice from the food available? In the light of the above-asked questions? The patient is then provided the care he requires after the assessment. This is a formal statement of nutritional interventions prescribed for the patient. It is based on the nutritional assessments talked about above. It contains the statements of nutritional goals and monitoring and evaluation parameters, the best administration route for nutrition therapy, nutrition access method, the expected duration of therapy, and training and counseling goals and methods. Nutrition intervention is also carried out it may include increasing the patient’s oral intake, giving oral nutrition supplements, and administering enteral and parenteral nutrition. Nurses play a vital role in conducting these. The patient’s nutritional status, nutrition goals, and safety and efficacy of interventions need to be monitoredon a continual basis, particularly with transition-of-care planning. 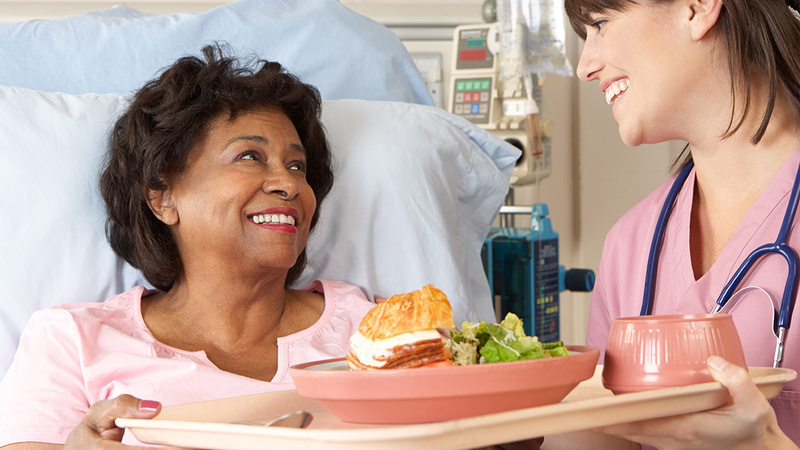 The patient’s nutrition care plan needs to be monitored during care transitions. Many times, nutrition interventions stop when a patient is discharged by the doctor. Almost in all cases, the patient needs to be readmitted with his Malnutrition worsening. A transition-of-care plan by nurses (such the A.S.P.E.N. Nutrition Care Pathway) can help pre­vent the patients from falling victims to it again. Malnutrition can affect people of all age groups, but the elderly are especially at high risk of being affected by a lack of food and water. People leave their loved ones at the mercy of nursing homes with their best interests at heart and hoping they will be taken good care of. But it is not uncommon for old people to go neglected in nursing homes. The staff shows utmost carelessness when it comes to food and diet as the residents are left unfed and dehydrated. Often the staff mistreats them holding their meals as punishment for something they did. It is terrible but it is true, and it needs to be stopped. Nurses must understand that the patients in their care are their responsibilities and the money they’re making after treating them this way is not honest. Shakespeare described the old man in his poem “The Seven Stages of Life” to have “sans teeth, sans eyes, sans taste.” This is true. As you grow old, your taste buds change, and you no longer find appealing what you did when you were nineteen. But that doesn’t mean you have to eat bland, grey oatmeal. If you are a nurse in a nursing home, plan visually appealing, nutritious meals for the residents to enjoy. You need to have patience with the folks you’re dealing with because with age, you grow a little cranky and ill-tempered but don’t be afraid; you are doing the world a service. You need to know of all the reasons there are to malnutrition, and you need to acknowledge them. Often you will find someone moderately obese in your care and it the reason for them to be there can seem perplexing to the eyes. But lack of proper nutrients can make you gain weight. If you find someone under your care who complains how little they eat yet they are sick and obese; you need to educate them about the importance of a balanced diet. Other reasons for malnutrition can be a loss of appetite, diarrhea, drug abuse, and any certain illnesses. It is not uncommon for people to roll eyes wheneverthey hear of someone being hospitalizedfor anorexia or other eating disorders. Statistics show that in every 62 minutes a person dies from an eating disorder in the US. Telling people in your care how they don’t need to get any slimmer or how it’s silly what they’re doing will not help them one bit. You need to have them trust you so you can provide them with the care they need. There will be people of all shapes and sizes suffering from eating disorders, andyou must not make them feel small because of them. Anorexic cases are strikingly high amongst teenage girls, andyou will get to know that they omit fat from their diet completely causing them to face several health issues. Tell them of the importance of fat in their dietand how they can not function well without it. You should try and educate the patients under your care to live a healthy lifestyle. Tell them about exercises they could do to build strength or lose weight. Learn about planks, crunches and anything useful and carry shareit further. Encourage morning jogs and the consumption of water. People don’t usually do something just because you advise them to. You need to tell them why they need a balanced diet. What each nutrient they consume does for them and why they are facing the symptoms they are. For example, a Vitamin A deficiency can cause Dry eyes, night blindness with an increased risk of infection. Zinc inadequacy can cause a loss of appetite, stunted growth, delayed healing of wounds, hair loss, and diarrhea while an iron deficiency can cause stomach problems, impairment of brain functions and the regulation of body temperature. You need to tell them why they are supposed to be taking whatever they are. There is always a fitness trend on the internet with another one to follow as it fades out. So many types of diets and so many advocates swearing by it. For example, the ketogenic diet has gained popularity over a very short time, and people have shared their experience with it, and they are proud. However, there are people following it who have reported to have gained weight and have symptoms of slight malnourishment. Why is that? You need to know about the diet to guide the patients. Similarly, the Skinny Coffee Club is taking the internet by storm. But is it something your patients should follow? Keep your information up to date. The saying goes “health is wealth,” and it proves to be true for without your health you will not be able to do all the great things you wish to. Malnourishment is usually considered not a severe issue and neglected. But, it is serious in the way that it can affect your performance, and when you don't have enough nutrition, it can disturb your mood. So, Let’s try to aim fit this year and encourage everyone to follow a healthy balanced diet!